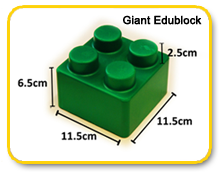 Edublocks are giant building bricks suitable for a wide age range of children that are safe, durable, strong, colourful and non-toxic. They come in a mixture of red, blue, green and yellow. 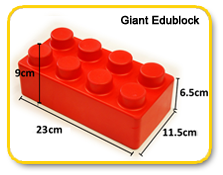 We will price match any other supplier, so if you find it cheaper please let us know. Made up of 28 doubles, 48 standard singles and 8 standard slope. Shipped in standard cardboard packaging. For additional boxes add £216.00 per box. If you wish to collect from Peterborough please contact us for price excluding carriage. 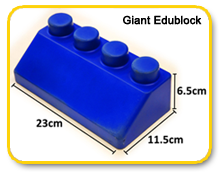 41 PIECE SETMade up of 13 double blocks, 24 standard blocks and 4 standard slopes. If you wish to collect from Peterborough please contact us for price excluding carriage. We would always hope to have plenty of stock but in the event we do run out we have to allow up to eight weeks for delivery. 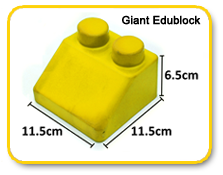 Please complete the 'Order Form' by clicking here with your details and how many boxes you require and we will forward an invoice.